Making the case for Christian higher education is more important today than it has ever been before. Christian colleges and universities have a mission and a calling to educate students, but could benefit from clear recommendations, impactful strategies, and ongoing support to bolster institutional enrollment and prepare an increasing number of students for a lifetime of ministry and service. 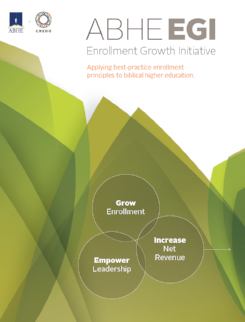 In order to serve and empower the institutions of the Association of Biblical Higher Education (ABHE), Credo has partnered with ABHE to develop the Enrollment Growth Initiative (EGI), a set of strategic services that can be customized according to student body and resource allocation to grow enrollment, empower leadership, and provide clear strategies and on-going support to positively impact enrollment and net. Download our free eBrochure by filling out the form to the right to find out more about the EGI. Clarity about the effectiveness of current strategies, systems, processes, operations, applications of data, enrollment research and team deployment. Strong enrollment strategies applied to your unique biblical higher education context, leading to improved enrollment. Increasingly empowered and capable enrollment leadership. A campus that understands their role in recruiting and retaining students. Realistic expectations for investments to be made in staffing and budget. Tools, strategies, and concrete plans for short and long-term enrollment growth. Find out more by downloading our free eBrochure, or contact us to get your institution started today on the trajectory to enrollment growth. Download the Credo | ABHE Enrollment Growth Initiative eBrochure here.